Updated 2/16/2016 The Missouri Sate Board of Education today decided that the Special Administrative Board should control St. Louis Public Schools for another three years. Yes. The same board violating Missouri Ethics Laws will remain in charge of our schools, not our elected board. I believe every child has a right to a quality education in public schools paid for with tax dollars. I believe good teachers should be among the most valued and best paid of occupations. I am, in general, in favor of raising taxes to accomplish both. I will not, however, support an illegal campaign to raise taxes for St. Louis Public Schools. 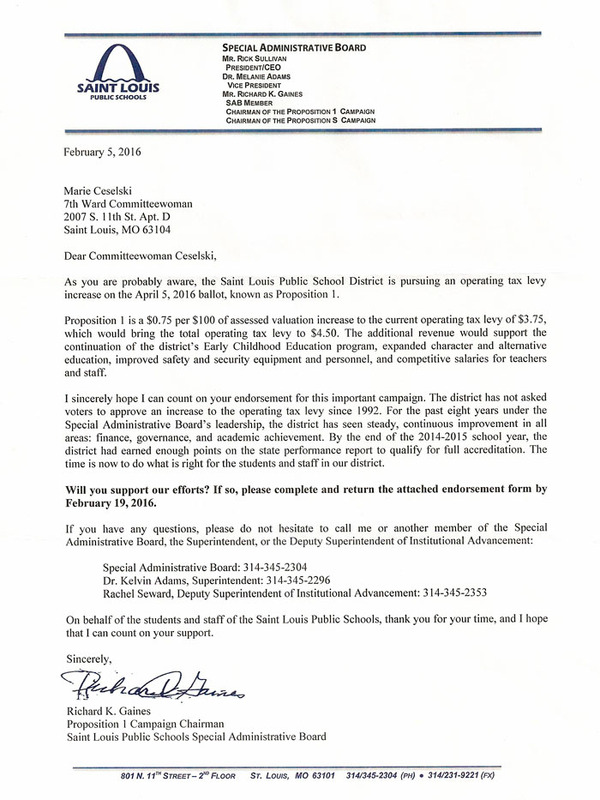 By Monday, February 8th, members of the St. Louis City Democratic Central Committee, ward committeemen and committeewomen, received a solicitation from the St. Louis Public Schools Special Administrative Board (SAB) asking for our endorsements of Proposition 1 to raise property taxes for public schools. The first thing that I noticed from the mailing is that a copy of the actual ballot measure was not enclosed. We were being asked to endorse the proposal based on what the SAB said it would do. That did not sit right with me. The second thing that I noticed was the use of “Proposition 1” by the SAB for the ballot. That did not sit right with me. The City of St. Louis also has a Proposition 1 for the same April 5th election, a bond issue which will not raise taxes. Then I noticed there was no “Paid for by” on the SAB letter, endorsement form, or envelope, and that the campaign was using resources paid for with tax dollars to advocate for the ballot issue, both violations of Missouri Ethics Laws. There was a conversation about this mailing on Twitter between 7th Ward Committeeman Brian Wahby, 15th Ward Committeewoman Missy Pinkerton McDaniel, and others. I entered the conversation on Tuesday, February 9th, after the St. Louis Public Schools Foundation declared no public funds were being used. That prompted a call to me on my landline phone from Rachel Seward, Deputy Superintendent of Institutional Advancement, St. Louis Public Schools (SLPS). Ms. Seward’s message was that the mailing had erroneously left off the “Paid for by” disclaimer, a new mailing was going out to correct the previous, and the campaign was being funded by a Political Action Committee. I returned the phone call and told Ms. Seward that sticking “Paid for by” a PAC on the SAB/St. 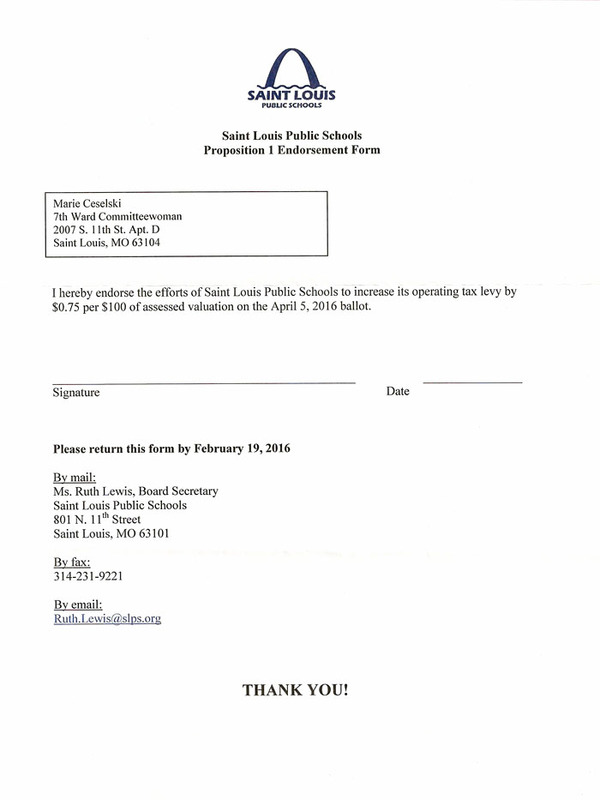 Louis Public Schools (SLPS) stationary would not have made the mailing legal; the use of SLPS resources including staff had tainted the campaign; and the SAB needed to pull the issue off the ballot. She listened and said she would pass along my concerns. Let me be clear here. This is not an “oops” moment. It’s a “we got caught” moment. Local government entities, particularly school boards, frequently have complaints filed against them with the Missouri Ethics Commission on use of public resources to advocate for ballot issues. I have not received the promised correction mailing from a PAC. Perhaps the SAB is waiting to see if someone actually files a complaint against them. It gets worse. According to a January 26th article in the St. Louis Post-Dispatch, the SLPS hired a campaign manager “to develop, coordinate and supervise the tax campaign at a cost of $60,000,” another clear violation of Missouri Ethics Laws. And this comes from the SAB, not our elected School Board stripped of its powers to run the SLPS District. The SAB is appointed by Governor Jay Nixon, Mayor Francis Slay, and Board President Lewis Reed. According to St. Louis Public Radio, Tuesday, the State School Board is poised to retain the SAB and not return control of our public schools to voters, retain an unaccountable, unelected board that currently is violating Missouri Ethics laws. As I said, I want to support our public schools with more funding. I postponed blogging about this last week because there was a fundraiser for a nearby public elementary school and I didn’t want to detract from it. But I will not, cannot, support a ballot issue for public schools that begins by breaking the law. I do not care who tells me this was all a series of mistakes now being corrected. The damage is done. I have no reason to believe that if I endorsed this school tax levy, another violation of state law will not happen. The best thing for everyone would be for the SAB to remove school levy hike from the ballot and start clean another time.